If you are shopping for a sturdy truck in Dover, New Hampshire? If so take a look at our inventory of Toyota Tundra trucks. 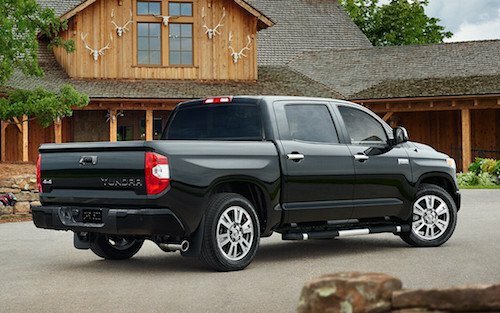 Dover area residents will find a selection of new Tundra models in stock now. We also have a large inventory of pre-owned trucks for sale, including used Toyota Tundra trucks. See our complete new and used truck inventory online and compare trim levels, vehicle details, MSRP and color options. New Toyota financing and leasing can be arranged at our auto finance center. We will explain your options for buying or leasing a new truck or help you arrange affordable used car financing. Our team is expert at finding the best special offers and incentive deals that will save you the most money and lower your monthly payments. Just let us know what your budget is and we will do the rest. We invite you to stop by and test drive a Toyota Tundra near Dover, New Hampshire today. Our team of Toyota experts is on standby to answer your questions.